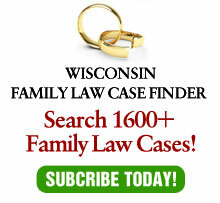 Note to the Wisconsin Court of Appeals: If shirking is an “unfortunate term,” as you characterized it in your recent family law decision, Chen v. Warner, No. 03-0288 (Wis. Ct. App. May 6, 2004; Errata June 14, 2004) (recommended for publication), please stop using it! In Chen, the District IV appellate court affirmed the Wood County Circuit Court, Judge James E. Mason presiding, which declined to find the former wife’s voluntary termination of her employment to be shirking for child support purposes. Following an 18-year marriage, Dr. Jane Chen and Dr. John Warner divorced in 1999. They had three young children and agreed to joint legal custody and shared equal placement. Each party worked full time with Jane earning $236,000 and John earning $256,000 annually. The parties agreed to hold open child support. Following the divorce, Jane sought and was unsuccessful in obtaining a part-time schedule in order to spend more time with the children. In May, 2000, at age 43, she quit her position. Undisputed testimony indicated that had she stayed in her position, she would have earned more than $410,000 in 2002. It was Jane’s intent to live off the investment income of her $1.1 million in savings, expecting an annual return of $110,000. When the market tanked in 2001, Jane earned only $32,000 in investment income and invaded principal to meet the shortfall. She again investigated securing part-time work but was unable to locate opportunities within the Marshfield area and she did not desire to work in areas beyond commuting distance. In January 2002, Jane filed a motion requesting child support from John. At that time, John earned $472,000 per year with an additional $73,000 in retirement benefit contributions made by his employer. Jane testified that her budget was $7,000 per month and she requested $4,000 per month in child support (presumably the shortfall between her budget and investment income in 2001). The trial court declined to use Jane’s earning capacity and ordered John to pay the $4,000 per month Jane requested. John appealed. After considering Jane’s motives, whether her decision was reasonable because it was foreseeable at the time of the divorce, whether she pursued opportunities, John’s ability to pay child support and the benefit to the children, the court of appeals concluded that the trial court reached a proper conclusion based upon the record. As noted by Judge Dykman in his dissent, publication of this case is unfortunate as rarely do divorce cases involve two such highly compensated (or, in the case of Jane, capable of being highly compensated) parents. Yet, by publishing the decision, its holding applies to all cases. Rather than compounding confusion, state the test as suggested above – one of reasonableness in light of the support obligation. This test recognizes that not all employment decisions are made to maximize dollars in one’s pocket. Rather, professional satisfaction, personal enjoyment and family obligations play substantial roles along with a myriad of other factors. At the same time, once a person has a support obligation, this is no longer a free country to make the same choices as before. Rather, the choice has to be measured in light of this obligation. Whether one agrees with the majority decision or with the dissent, however, it is high time that the court of appeals adopts a consistent rationale for family law cases involving choice of income. And, this rationale should be based upon fairness and equity, not semantics.